INDEPENDENCE, Calif. (AP) — We were trudging up the side of a mountain on skis to measure California’s massive snowpack when a late blast of winter stopped us in our tracks. I started the morning less concerned about strong winds forecast and light snow than keeping pace with veteran snow surveyors in the thin Sierra Nevada air and getting over steep, icy 11,700-foot Kearsarge Pass. Now, shy of that goal, I was struggling to keep warm and stay upright. Howling gales warned to brace for impact. It didn’t matter. Gusts bowled me over and toppled Kevin Klinefelter. Staggering to our feet, we followed John Dittli, making turns in a near-whiteout between foxtail pines. Blown downhill to our cars, we decided to return another day. 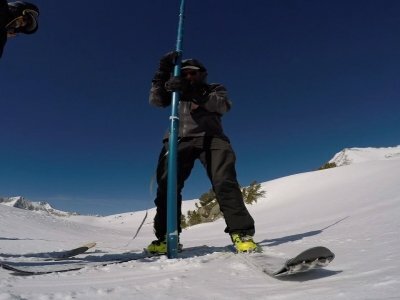 The arduous work of snow surveyors is largely unknown to most Californians, even as measurements they compiled of a near-record snowpack bolstered Gov. Jerry Brown’s decision last week to lift an emergency declaration after five years of drought. Crews stay out as long as two weeks in alpine wilderness, battling the elements, skirting avalanche terrain and plodding through deep powder to gather the data — a practice that has endured even as new technology tries to gauge the state’s expected water supply from snowmelt. To get a feel for the experience, I had skied in alone the night before under a sky awash with stars and a slice of moon that hung like a wry grin atop the jagged skyline. Using a headlamp to follow Dittli and Klinefelter’s faint tracks a couple miles to a cabin high above, I had little idea of what lay ahead. Snow surveys date to the early 1900s when a University of Nevada professor developed a method to weigh water content in snow and predict runoff into Lake Tahoe. Dam operators used the information to prevent flooding and save water, ending a fight between lake residents and land owners downstream. The practice adopted by water agencies and power providers was eventually coordinated by the state. Remote sensors installed 40 years ago provide real-time depths, though not reliably. In recent years, satellite imagery and planes using lasers have measured snowpack from afar. Despite predictions technology will make snow surveys obsolete, David Rizzardo of the Department of Water Resources said boots on the snow will probably be needed two more decades to verify and fine-tune remote data. Snow surveys remain some of the state’s best-preserved climate records. Rangers, utility and water agency employees, and state workers survey more than 250 areas — known as snow courses — monthly from January to May. Snowmobiles, helicopters and snowcats are used to reach many courses, but hardy skiers still travel to remote wilderness where machines aren’t allowed, sheltering in rustic cabins along the way. Sierra Nevada means snow-covered mountain range in Spanish. In winter, it’s like a 400-mile frozen reservoir that holds up to a third of the state’s water supply. In recent years, imposing peaks that soar above 14,000 feet were less snow-capped and canyons and meadows sparsely covered. Two springs ago, Dittli and Klinefelter hiked the high country in shorts and running shoes to measure a mostly nonexistent snowpack. They bicycled to Devils Postpile National Monument, where not a patch of snow remained. The day after being driven down the mountain by wind and snow, we reassembled about 10 miles below Bishop Pass, a 12,000 foot gap dividing Inyo National Forest from Kings Canyon National Park. We were joined under blue skies by Klinefelter’s wife, Ann. The four of us — all in our 50s — fastened our boots into ski bindings and were almost immediately fighting our way along a steep, icy hillside above a reservoir. South Lake had been drained to make room for snowmelt and its buckled ice looked like an earthquake had struck. After huffing and puffing uphill through a pine forest, we emerged in a clearing marked at each end with orange snow survey signs. With sections of snow tube assembled, Ann Klinefelter paced 50 feet between the signs and plunged the tube through the snow to the ground nearly 7 feet below. She noted the depth, withdrew it and placed it on a scale her husband dangled from a ski pole. Dittli penciled the depth and water content in a notepad. She repeated the cycle several times and found the water content double the average for April 1, the most significant measure of the year because it marks the normal start for runoff. When we reached the cabin, we dropped backpacks and sat in the sun in a motley assortment of beach chairs sheltered from the breeze by a towering wall of snow in front of the small stone cabin. Built in the 1950s, the bare-bones shelter features two bunk beds, a wood-burning stove, a propane stove and a cupboard stocked with canned and packaged foods hauled in by mules. Because the wind had scoured a clearing around the Bishop Pass cabin, it was one of few the crew did not need to shovel out. Dittli and Ann Klinefelter joked about how her husband shirked digging duties on the lengthy Kern River tour this winter. Kevin Klinefelter had climbed through the second-story entrance of a cabin to light a fire but never emerged while they shoveled for more than an hour. As avid backcountry skiers, all three welcomed the near-record snowpack even as it raised avalanche danger, made for slow plodding at times and extra grit to drive the snow tube more than 11 feet deep through icy and dense layers. Each waited years for an opening to join the crew. Kevin Klinefelter even uses vacation from the U.S. Forest Service to participate. The $105-a-day pay is not enough to make a living, but it’s not a bad way to live. In Sacramento, Rizzardo fields dozens of inquiries a year from people interested in a job, but the ranks thin when they learn that areas far less rugged than the eastern Sierra can require skiing eight miles. “Well, yeah, we don’t jet pack in,” he tells them. For the effort to climb thousands of feet on skis with a backpack in blustery conditions or under the relentless sun on a clear day, there is always a payoff. After measuring snow beneath the craggy, spectacular Palisades in Kings Canyon on the final morning, we stopped briefly atop Bishop Pass, where the landscape plunged to a series of rolling slopes and lakes that stretched to the arid brown valley in the distance. Dittli cut turns through crust that flaked off and we followed for the long descent that took us speeding across the snow at times and shuffling at others to reach our cars. A hiker we whizzed past arrived at the parking area as I loaded gear in my car. She asked where we had come from. She was unaware of snow surveys, so I explained.